Some of you may recognize me from other websites under the same name, but hello to everyone else! 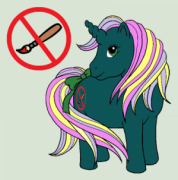 I've been looking for a pony trading site for a while now so I jumped at the chance to start here when I found it. I'll be looking forward to buying and trading here! Hi Eddicted Brony! Welcome to the Trading Post! Hello, Welcome, what ponies do you have for trade? are you in the g4 mode? I mainly do G4 ponies. I do have a few Power Ponies mystery minis (two angry Filli Seconds and two angry Mistress Marevolous) I have for trade or to sell but that's about it for now. Howdy from Texas! DO tell us about yourself!